I read this article and found it very interesting, thought it might be something for you. The article is called Contextly Helps You Find Best Related Content of Your Choiceand is located athttp://innov8tiv.com/contextly-helps-find-best-related-content-choice/. When someone visits a site and reads an article the worst thing that happens is that, they don’t get a good recommendation on what to read next relating to that article. This leads to less interest in that particular site and ends up losing the reader. For this purpose a startup called Contextly is trying to make things better. The job of Contextly is to recommend readers articles which they will actually like and that is related to what they are reading. So they would become regular readers instead of just checking one article and then leaving. Contextly will help publications to attract more audience to their content by making readers dive deeply into the content due to related recommendations. Publishers will be able to add related content at the end of post and some tools are also provided by Contextly to add links and sidebars. Contextly recommends content on the basis of different factors like tags, semantic similarities and links. The good part is editors are not bound to follow the automatic recommendation system they can also recommend manually or even do it manually with automatic selection. Contextly will not be recommending content which is not located on the site, unlike other companies which recommend content which is not even on the site. 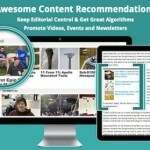 Contextly will only recommend content which is located on the editor’s site. It is very important to make the readers stay on your site, not just to gain page view but to make the readers regular readers of the site. Contextly want to build a relation with publishers who want to create high-value readers on a long-term basis by providing there high-value readers with high-value content and recommendations. Publishers like content marketers, niche publishers, company blogs and trade publications will be ideal users of Contextly.